AMD ThinkPad. 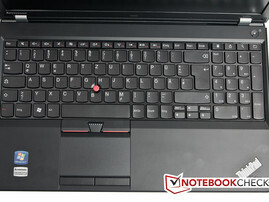 With the ThinkPad Edge E520, Lenovo already had a 15.6-inch notebook with Intel processor in its portfolio. Now with the ThinkPad Edge E525 it has an AMD processor variant. With the Lenovo ThinkPad Edge E525 , Lenovo has a 15.6 inch ThinkPad-Edge model with AMD Fusion processor for our editorial staff. While we had already tested the Lenovo ThinkPad Edge E520 with Intel Core processor, we still had to try out the E525 with AMD's chip. Our test rig was an A8-3500M Quad core from AMD for a healthy amount of processing power supported by 4GB of RAM and an AMD Radeon HD 6620G. The lush 750 GB HDD rounds out the package. As with other ThinkPad-Edge notebooks, Lenovo is again using a somewhat fresher and more modern design than the rest of the business notebooks. Here the ThinkPad-Edge devices with AMD processors are priced even lower than their Intel siblings. We test to find out how the AMD model fares. 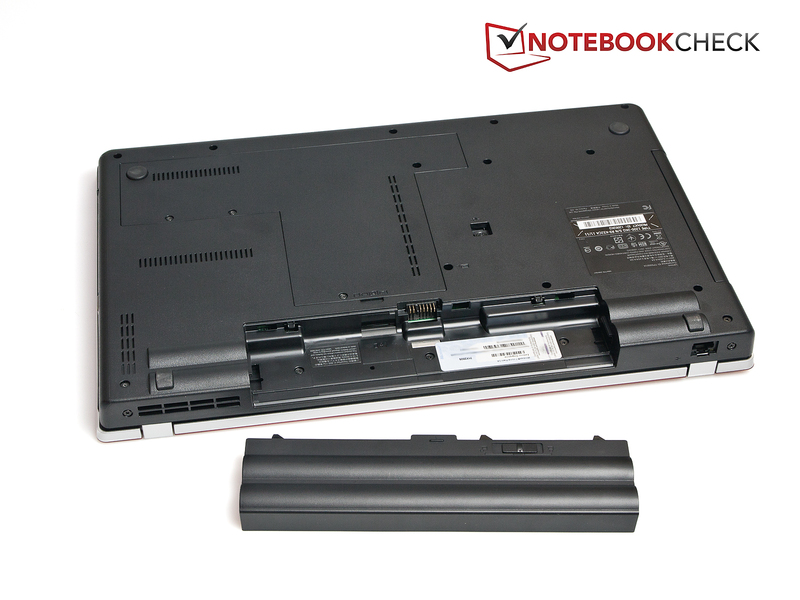 The casing of the ThinkPad Edge E525 is identical to the ThinkPad Edge E520. 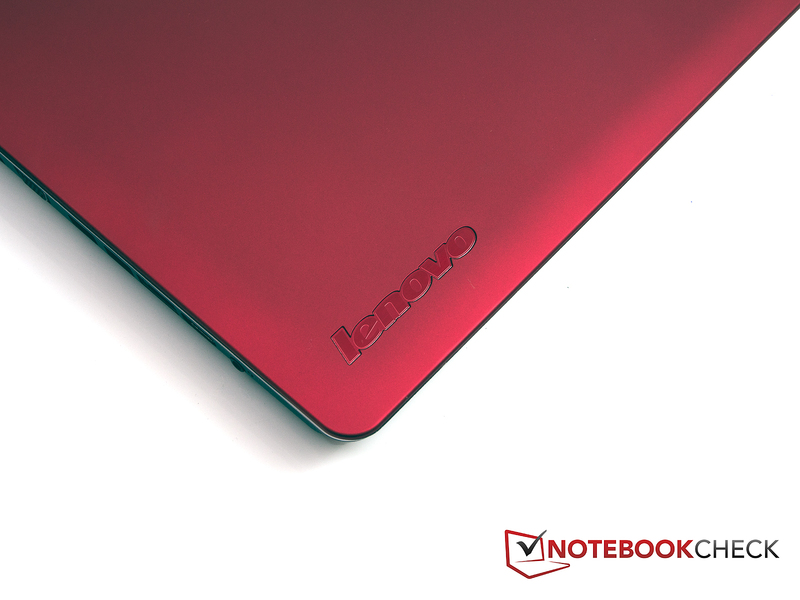 It comes with the same Soft touch surface coating as the E520 and the smaller ThinkPad-Edge models. For housing stability, the ThinkPad Edge E525 is quite decent. The wrist rests are very stable and do not give way under pressure. The stability of the keyboard is not quite the same as the palm rest. Specially in the middle of the notebook and over the DVD-player the keyboard gives way a little. The display can be twisted with very little effort, and the content is not distorted. The display latches are so tight, that the screen cannot be opened with one hand. The chassis is lifted off from the desk. The display does remain on the spot once opened, however. The loose fitting optical drive can be moved slightly back and forth and is disappointing, also a problem with the loose fitting battery. Here we expected a better fit from Lenovo. 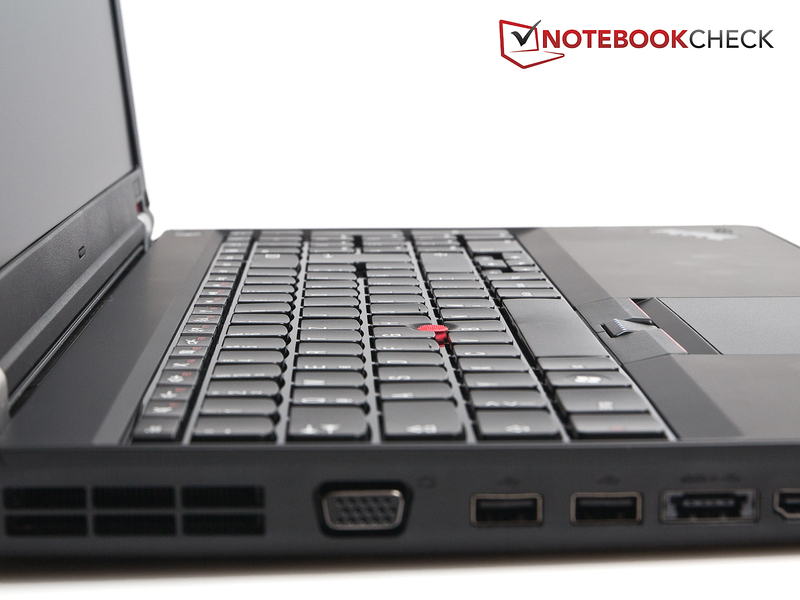 The connectivity has also not been altered since the ThinkPad Edge E520. The USB 3.0 is still omitted. The equipment is still as standard as possible, with only the ExpressCard-34 slot in the notebook setting it apart from the rest of the masses in this segment. Despite claims of being a Business model, Lenovo continues to dispense with the docking port. The arrangement of the connections paints the same picture: Except for the network jack, which migrated to the back, all the connections are distributed on both sides of the case. The potential problem lies to the right of the case, with the USB port and Express card slot. They are both located directly over each other. If one of the plugs is a bit big, the other port cannot be used at the same time. This is the part that makes the ThinkPad Edge something for everybody. 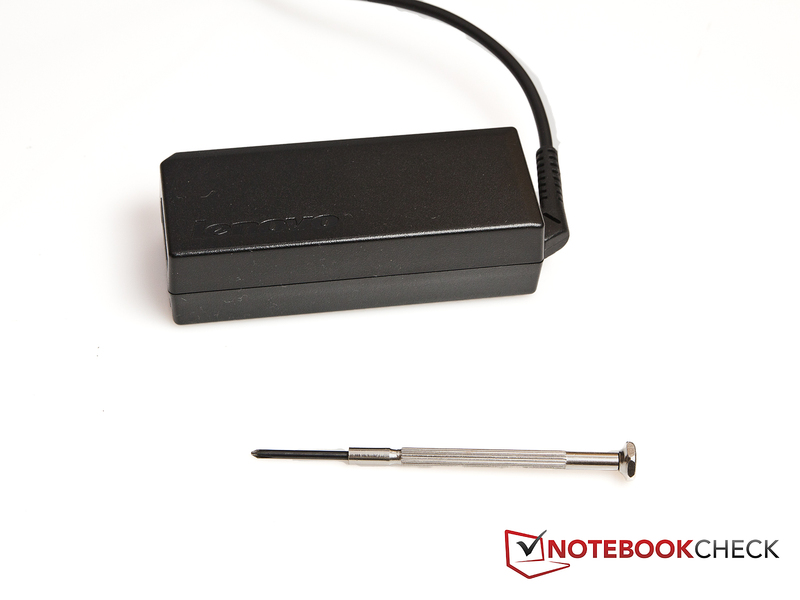 In addition to Bluetooth in version 3.0, the notebook has a WLAN adapter with wireless standards 802.11b/g/n. The wired connection comes with a Realtek card and delivers Gigabit LAN. UMTS/3G is not included in our test package. The corresponding slots are present, but the antennas are absent. The delivery of the notebook is very spartan: Except for the notebook itself, the power supply and cord, a little printed manual is present and no extras are in the box. Business notebooks usually have a wide range of security features. 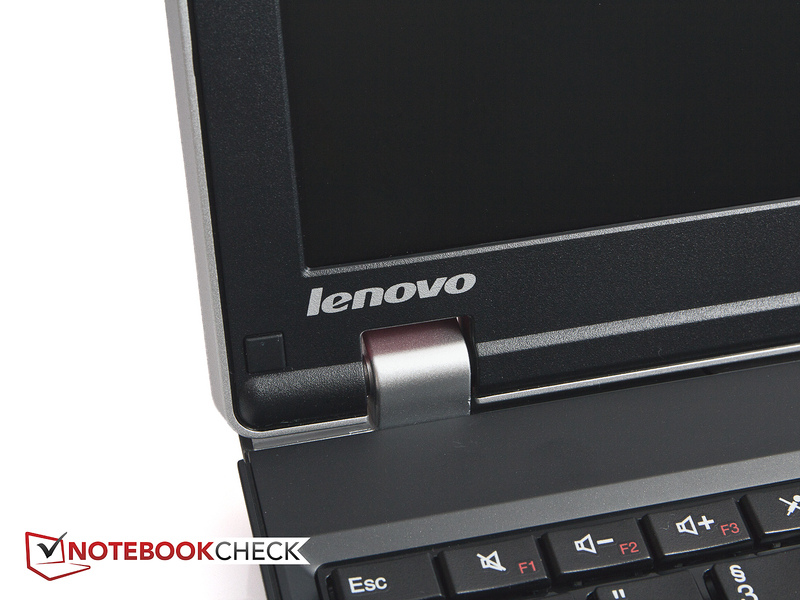 With the ThinkPad Edge E525, Lenovo has cut a lot of corners. Besides the obligatory Kensington lock there are no other security features to be found. 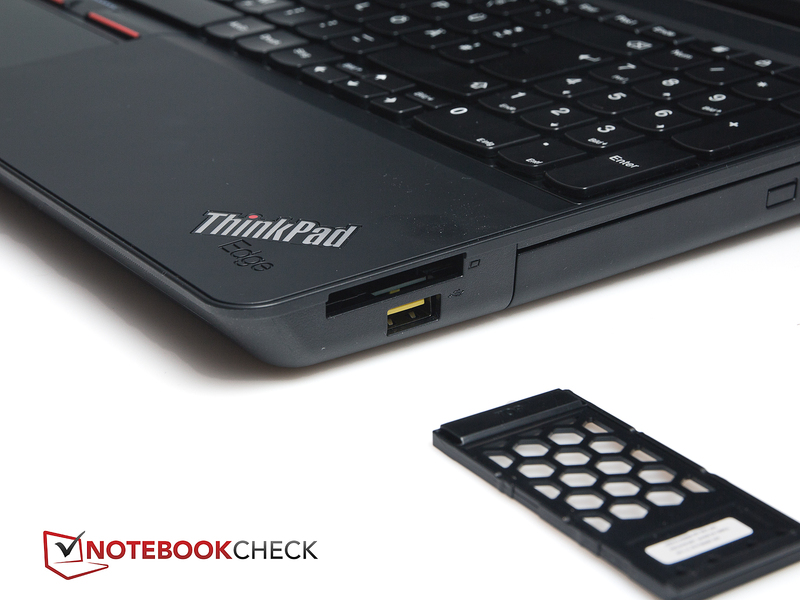 Don't look for a TPM chip, SmartCard reader or fingerprint sensor in the ThinkPad Edge E525. Via T shaped opening underneath the SATA 2.5 HDD and the two RAM modules can be easily reached for maintenance. Upgrading RAM and HDD is therefore not a problem. Of the two RAM modules in this test, one is still unused. The cooling system cannot be accessed via the maintenance hatch. This makes cleaning of the fans and coolers (warranty ?) difficult, should they get dirty. 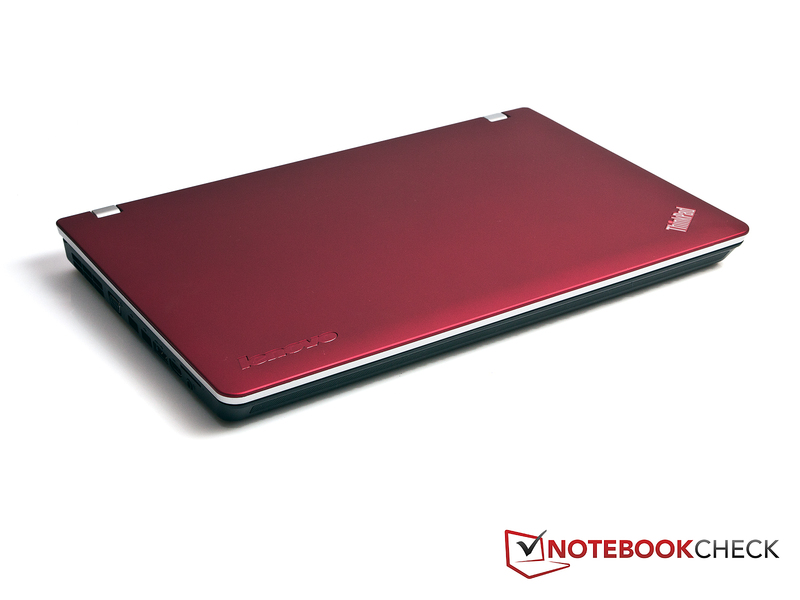 Lenovo warrants the notebook and battery for a warranty period of 12 months. This is quite common for many cheap laptops today, but 24 months or more is expected for business laptops. Up to 3 years on-site service is available for roughly 120 Euro. 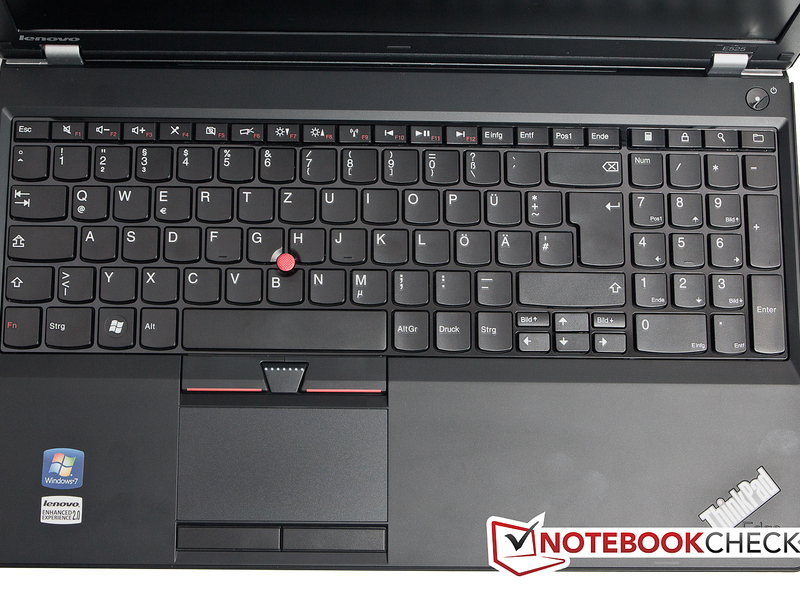 The keyboard is the same as the one present in the Lenovo ThinkPad Edge E520. The 16 x 16 Millimeter sized buttons allow for comfortable typing. Larger hands should thank the independent keys and generous spacing which make it easy to find your way around. 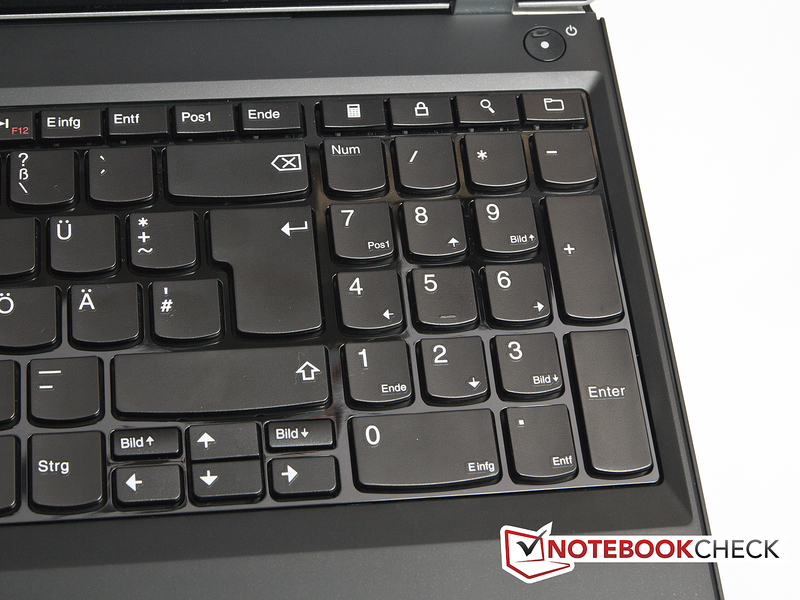 Also from the ThinkPad Edge E520, a shiny surface is present on the keyboard. After frequent use, fingerprints are everywhere and can only be cleaned again with great difficulty. Purely subjectively, the keyboard was nonetheless quite good. 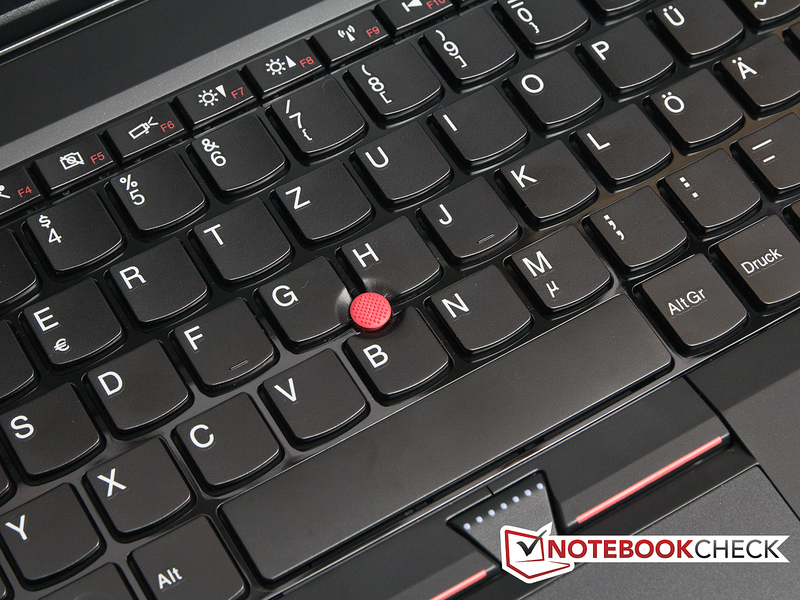 In addition to the touchpad, there is a red Trackpoint in the middle of the keyboard like in Lenovo's ThinkPads. Its use is a matter of taste and preference. The touchpad has generous dimensions of 93 x 50 millimeter (diagonal: 105 millimeter) and good sliding response. The two touchpad buttons are very quiet when clicked and give less acoustic feedback to the user. The pressure point could be crisper and feels a little damp in our opinion. 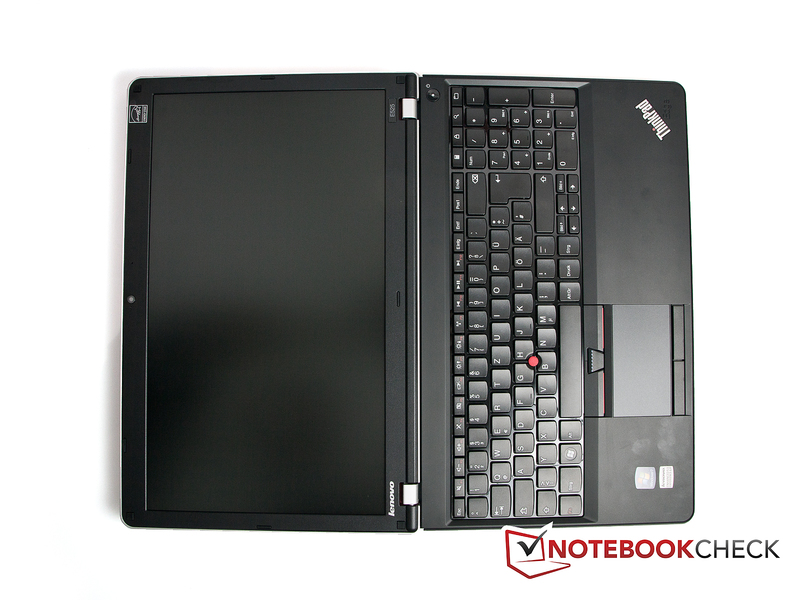 Lenovo equipped the ThinkPad Edge E525, as a Business (Office) Notebook, with a matt display. It is a 15.6-inch model with a resolution of 1366 x 768 pixels. The panel is, in contrast to the one in the E520, made by LG Display and is backlit with LED. Our brightness measurements show an average brightness of 210.3 cd/m². This is not a very high value for displays today, but is sufficiently comfortable along with the matte display. Looking closely at the individual values, there is a nasty surprise: While the maximum value is 252 cd/m² , at its darkest, it is 170 cd/m². That is a difference in brightness of 82 cd/m²! The values are spread so that, one can see the brightness curve of the left side even with the naked eye. This results in a poor illumination of the display at 67 percent. Even then, there is a small consolation in the fact that Lenovo does not automatically throttle the brightness on battery power. The black level of the display fails at a too bright level of 1.59 cd/m² and pushes the contrast to a low 142:1. Lenovo can not be proud of this display. The comparison with the sRGB color space shows that the display cannot display the entire range. Someone who is dependent on the full color range of his display for his work, will not be satisfied with the ThinkPad Edge. For outside use, the display of the Lenovo ThinkPad Edge E525 gave no problems. The matte finish makes for a clear image display with even moderate brightness. Even in direct sunlight (which admittedly is currently not very bright), the screen contents are easily visible. Overall, a slightly higher brightness would be even more welcome here. The viewing angles of the display do not deliver a performance to match other anti-glare displays. So we would tend towards a below average rating. Looking at the picture you can also see that the lower left corner is brighter. 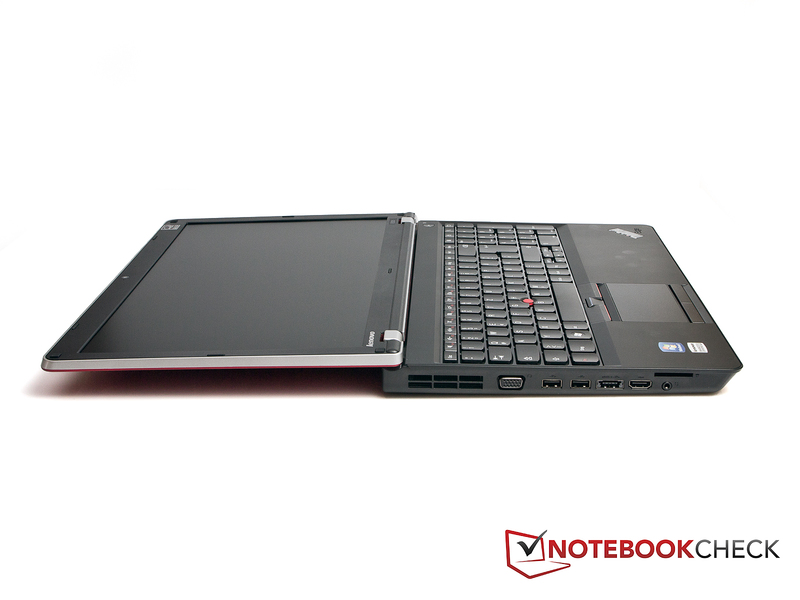 Our test model of the ThinkPad Edge 525 is a stronger version of the E525. The other models are equipped with less powerful processors, less memory and/or less hard disk capacity. The Lenovo ThinkPad E525 as mentioned before, is the version with the latest AMD Liano APU (APU = Accelerated Processing Unit). Like with Intel's latest Core family, the graphics is integrated directly into the processor. The AMD A8-3500M processor is likely an entry level integrated GPU. It is a quad core processor with a range of 1.5 GHz – 2.4 GHz per core. As with Intel processors, the maximum clock speed of the cores depends on the current load. When only one Core is loaded, the processor hits up to 2.4 GHz; with all 4 cores loaded, the clock lies at 1.5 GHz per core. 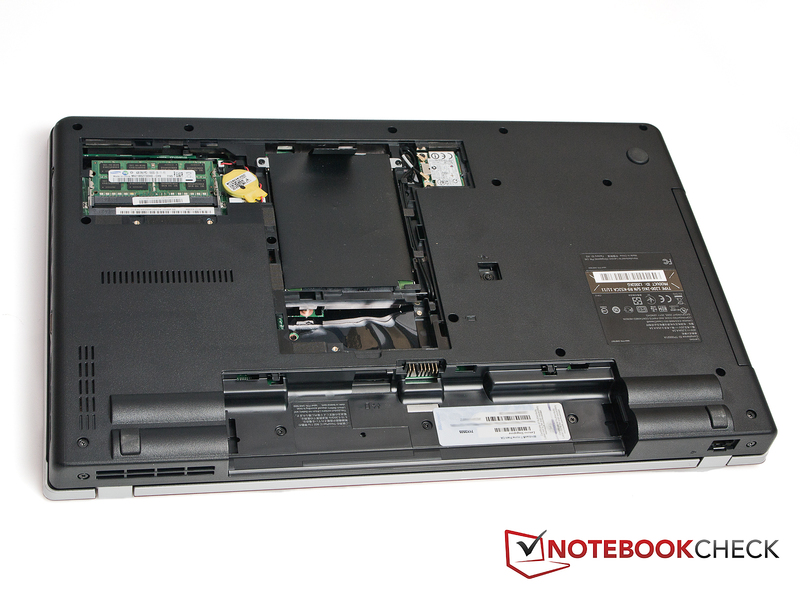 With a TDP of 35 Watts, the processor is best for notebooks with display sizes from 14 inches. To assess the performance of the AMD A8-3500M processors, we used Cinebench version R10 and R11.5. In the first benchmark, Cinebench R10 Rend. Single (64 bit), the ThinkPad Edge E525 reached a value of 2030.0 points. Here only one core from the CPU is used for the benchmark. Compared with other notebooks that use the AMD A8-3500M, it is about equal. Compared with, for example, the Dell Vostro 3555 (A8-3500M, Radeon HD 6620G) with its score of 2085.0 points, the results are very close. In comparison with the Intel Core i3-2310M, the AMD processor is the slower one. E.g., Lenovo's ThinkPad L520 NWB53GE (2310M, HD Graphics 3000) achieves 3412.0 points and is well above the ThinkPad Edge E525 Notebook. In the Cinebench R10 Rend. Multi (64 bit) benchmark,we get a similar picture: The Lenovo ThinkPad Edge E525 got a score of 6721.0 points. 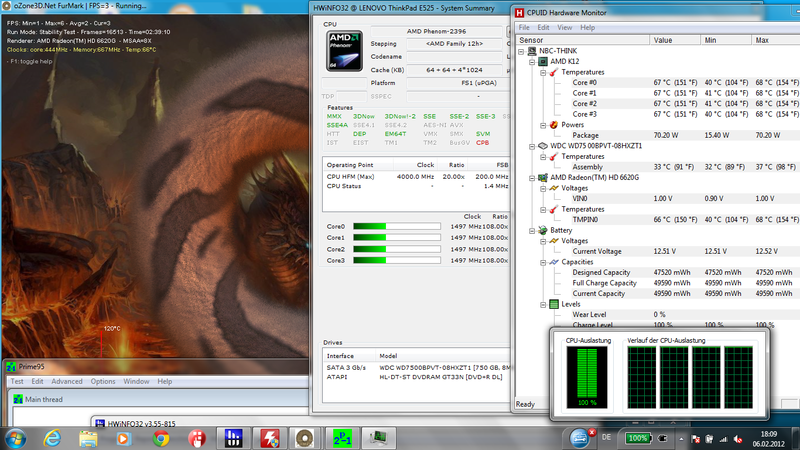 As all cores of the processor are used and it can score with multiple cores. 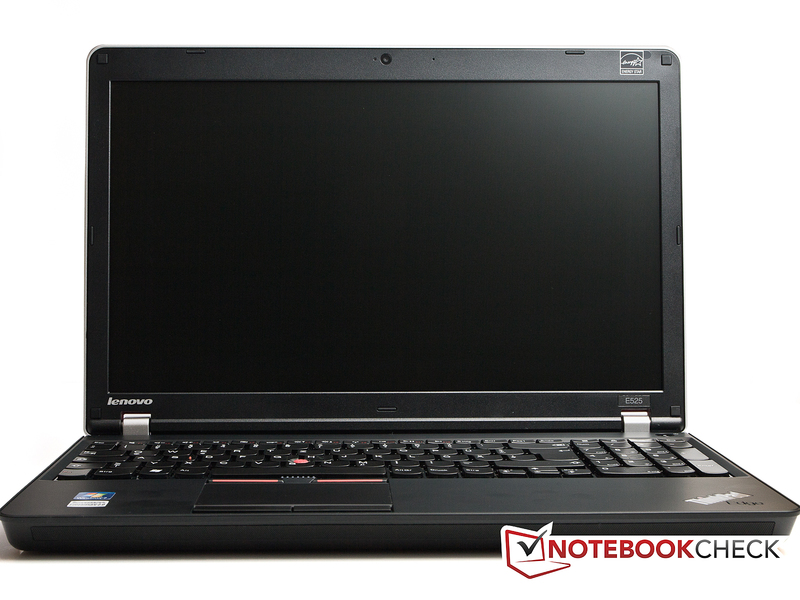 The notebooks with the same processor are again similar to the ThinkPad Edge E525. The Intel Core-i3 processors lie ahead of the AMD processor again in our benchmark lists, with a difference in points that has remained the same as before. An example would be the Samsung 200B5B-S01DE (2310M, NVS 4200M) with 7285.0 points. The automatic throttling of the CPU-clock worked fine in out tests. In tests where only one core was loaded, the clock speed moved up to 2.4 GHz (2395 MHz), and with the simultaneous loading of all cores, the clock was at 1.5 GHz. At idle, the clock is at 800 MHz. We could observe the impact of this on both the AC power as well as battery. To assess the performance, two programs were used, PC Mark Vantage and PC Mark 7. 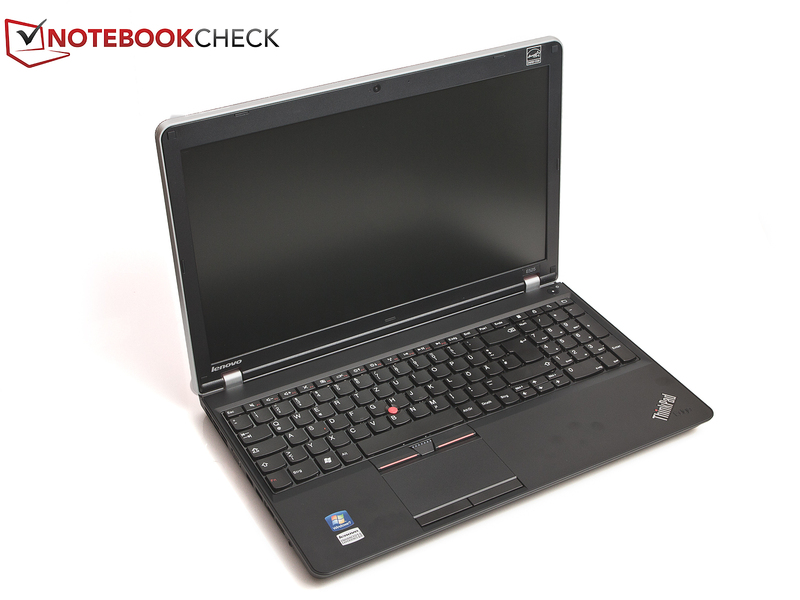 In the PC Mark Vantage benchmarks the Lenovo ThinkPad Edge E525 achieved a score of 4200.0 points. 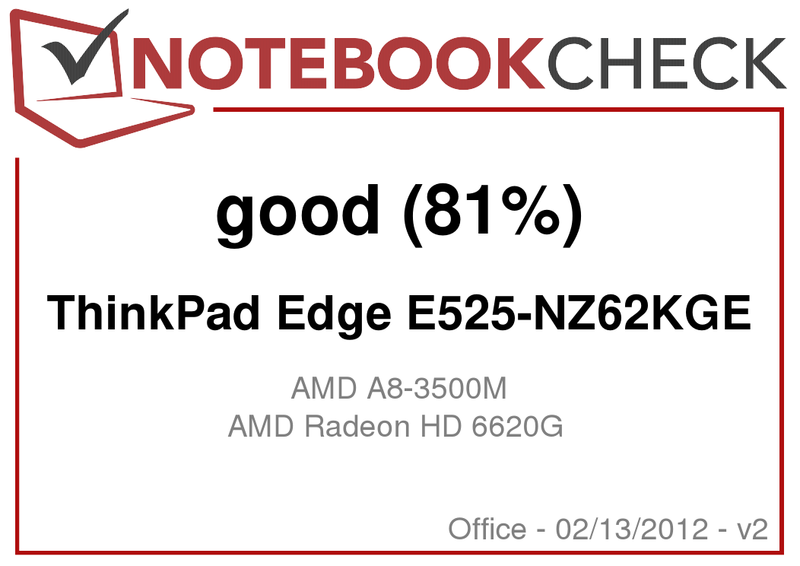 In comparison with other notebooks with AMD A8-3500M processor the ThinkPad Edge E525 does not do badly. In comparison with the Acer Aspire 5560G-8358G50Mnkk (A8-3500M, Radeon HD 6740G2) with 4388.0 points, the difference is not great. The difference between some Intel Core i3 has also shrunk. Comparing with the Lenovo ThinkPad L520 NWB53GE (2310M, HD Graphics 3000) with 4300.0 points, the difference is just 100 points. However the ThinkPad L520 has only 2 GB RAM and a 320 GB HDD. The PC Mark 07 benchmark confirms the picture from the PC Mark Vantage benchmark. Here the difference to the Core i3 processors is increased slightly. With the WDC WD7500BPVT-08HXZT1 HDD is a 2.5-inch model with a speed of 5.400 rpm. With a total capacity of 750 GB, there should be enough space for most of the data to be stored. If one assumes that on a office notebook like the ThinkPad Edge E525 there would be few videos and pictures to be stored, the storage should last a long time. The power supplied to the hard disk is not much different from other disks used in other notebooks. Based on the results from HDTune, the average and minimum transfer rates are slightly above average. The access time of 19.9 milliseconds is not very fast, but is enough. The processor has an integrated graphics card onboard, the AMD Radeon 6620G. It is the fastest integrated card, that AMD has to offer for its processors. The card has only 400 shader cores, and must rely on system memory, because no dedicated memory was allocated. It is about as fast as the Mobility Radeon HD 5650 middle range graphics card. Comparing with the integrated graphics from Intel, the Intel HD Graphics 3000, the AMD Radeon 6620G should be well ahead. But, the integrated card is still not as good as the 6620G, but should be able to play back most titles smoothly. To judge the graphics performance, we took the benchmarking program 3D Mark 06. 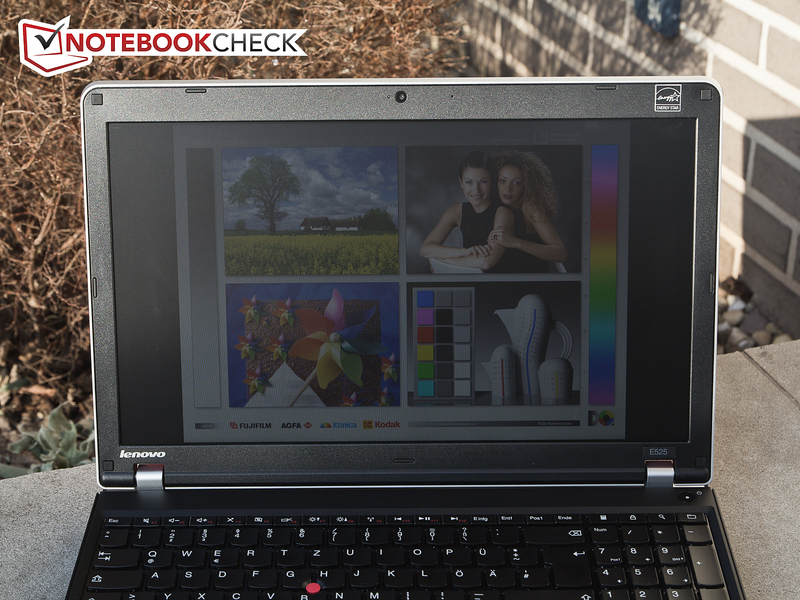 With the built in Radeon HD 6620G graphics card, the Lenovo ThinkPad E525 notebook got a result of 3815.0 points. Thus, its likely at the bottom of our benchmark list. Compared with the integrated Intel HD Graphics 3000 graphics chip, the Radeon HD 6620G is usually more powerful. 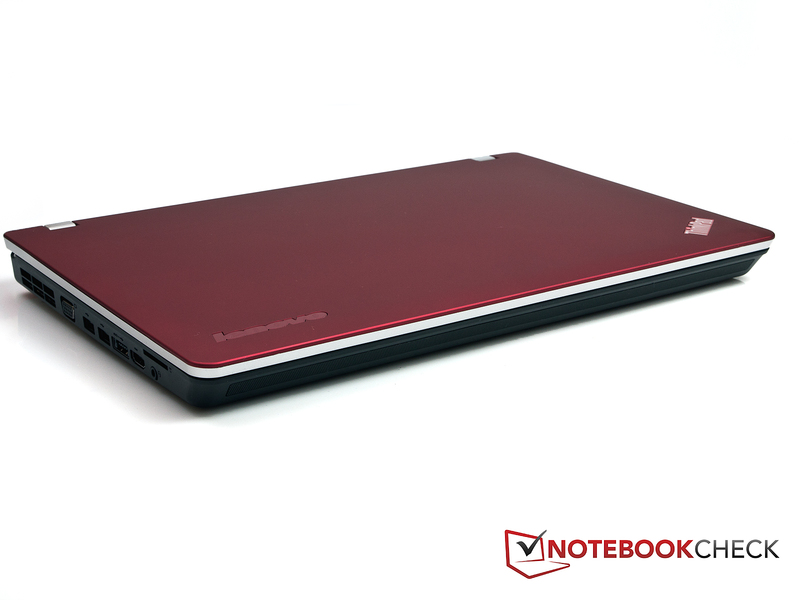 But, there are some exceptions, such as the Packard Bell EasyNote TS11 HR-040UK (2410M, HD Graphics 3000) with a score of 4607.0 points. It should also be mentioned that the Packard Bell Notebook with HD Graphics 3000 reached an exceptionally high score for a HD Graphics 3000 cards. Somewhat over the ThinkPad Edge E525 lies the MSI CX640-i547W7P (2410M, GT 520M) with 4572.0 points in our benchmark table. Naturally, the ThinkPad Edge also had to undergo some gaming tests. Although one must clarify that the notebook was clearly not a gaming machine. This shows up clearly in our benchmarks. The only two titles of the test suite that run smoothly at low resolutions and minimum details are Anno 2070 and Dirt 3. Deus Ex Human Revolution and The Elder Scrolls V: Skyrim were not running smoothly even at this level of quality. And as soon as one increases the resolution or the details, Anno 2070 and Dirt 3 also start to stutter. Other benchmarks on the latest games can be found in our lists. In idle mode (office tasks, net surfing) the ThinkPad E525 is very quiet. With 30.4 dB(A) – 31.9 dB(A) it is hardly noticeable. However from time to time we were able to notice the noise from the cooling system. The hard disk can go up to 31.6 dB(A) which is somewhat noisy. Thankfully, the DVD-drive is one of the quieter models with 33.8 dB(A). Other drives can come up to a value of 38 dB(A) or more. 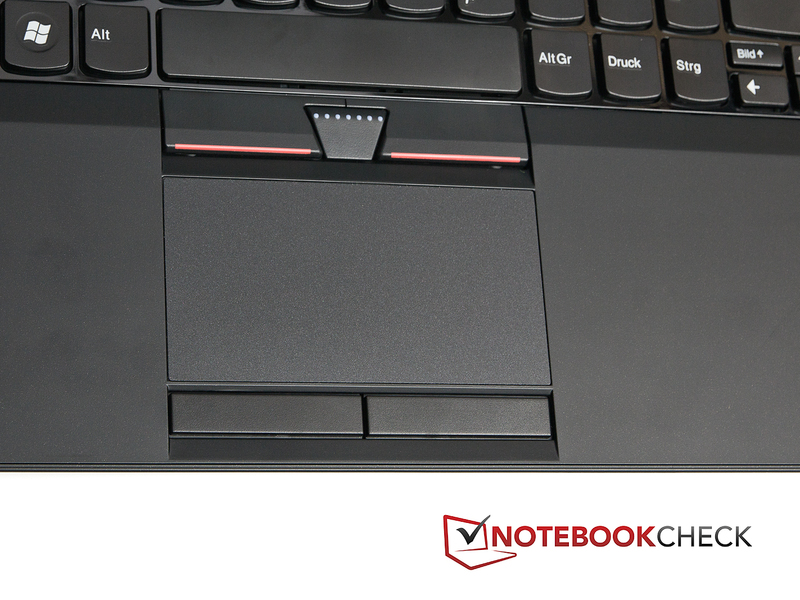 If you use the notebooks at times as a DVD player, there should be no disturbing noises coming from it. 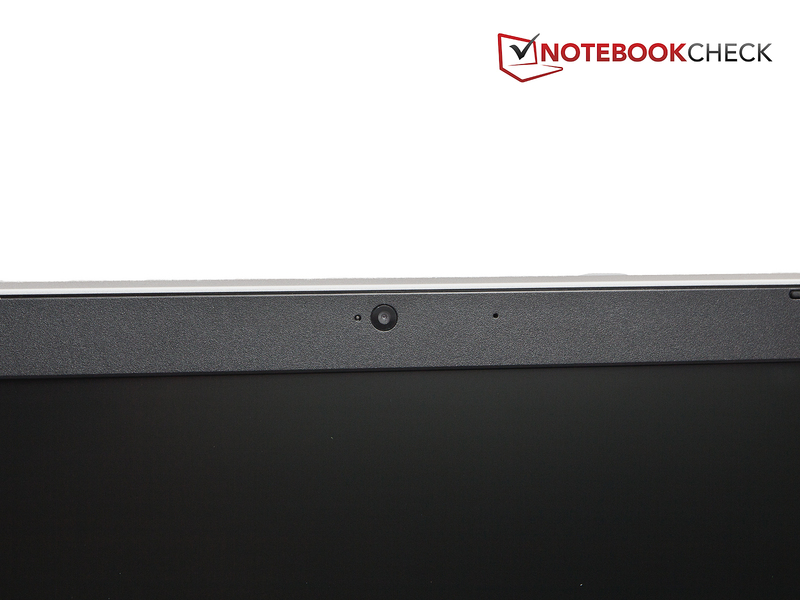 Under stress, the volume level of the notebook increases to around 34.1 dB(A) – 34.4 dB(A) at most. We could not find disturbing noises coming from the capacitors. 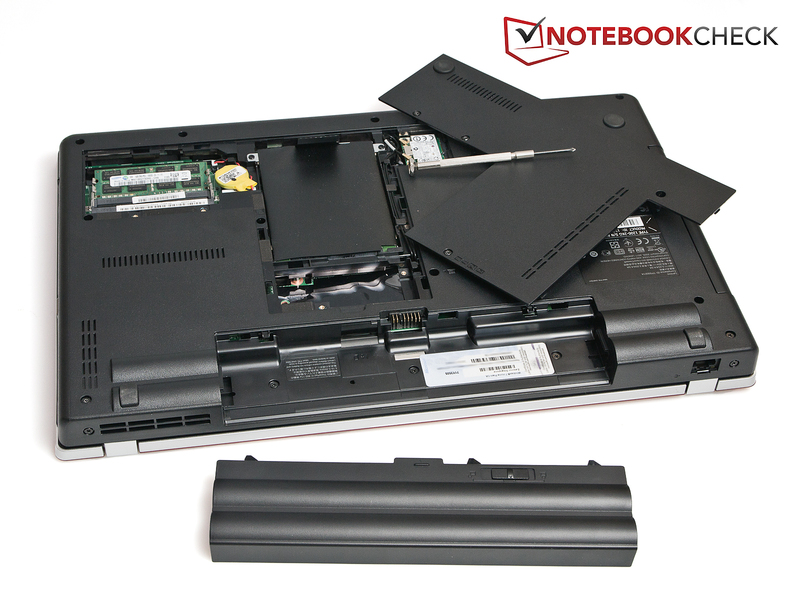 Regarding the temperatures of the Lenovo ThinkPad Edge E525, we were able to discover nothing unusual in our review. On the contrary, the surfaces of the notebook remain lukewarm or cooler. Interestingly, the temperature difference under load and idle was marginal. The average temperature between the two modes vary only by a few degrees Celsius. 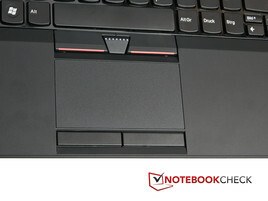 The warmest point of the Lenovo ThinkPad Edge was at the top and not at the bottom as expected. The notebook remains cool and pleasant, all in all. In our full load test, the processor reaches 68 degrees Celsius, according to the benchmark program. This ensures that the data is in a temperature range in which you do not need to worry - even if it was during summer time when it's warmer. The subsequent 3D Mark 06 benchmark gave a score of 3814.0 points and no great deviation from the result of 'cold'. 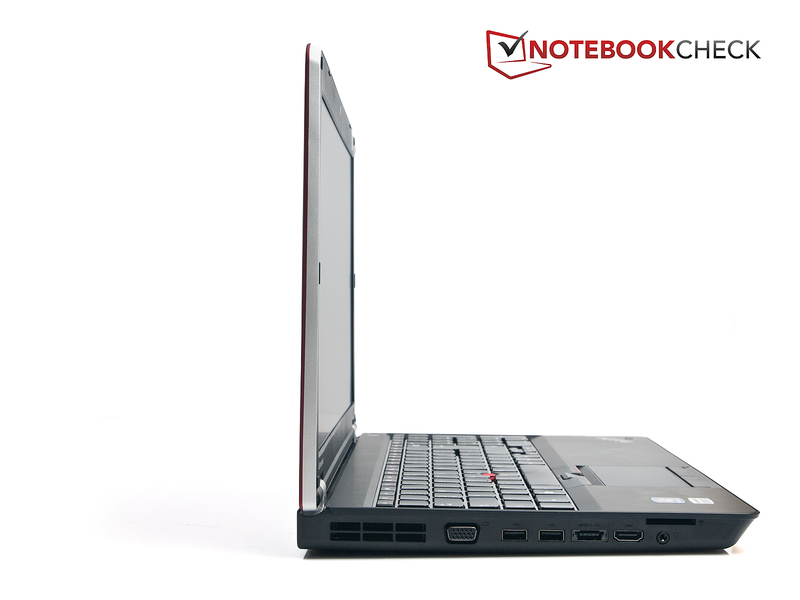 The notebook speakers in office and business notebooks are usually not the best and so it is also with the Lenovo ThinkPad Edge E525. While the volume is fine, we were not persuaded by the sound quality. Bass is not present and the overall sound is a bit tinny. Seeing a movie on the notebook is still ok, but for music enthusiasts should use headphones. 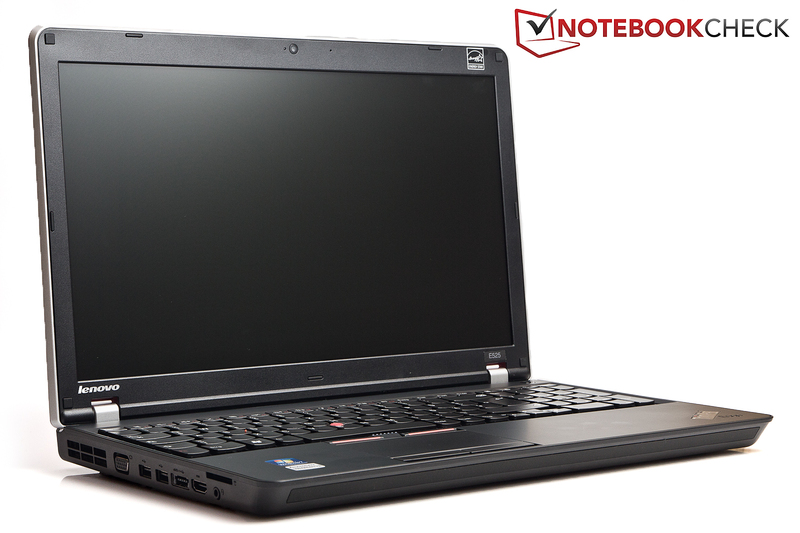 In terms of consumption, the Lenovo ThinkPad Edge E525 can be compared to the E520 with Intel Core i3-2310M processor. In idle mode, the AMD processor is slightly more efficient than the Intel processor. Under stress, the two processors are nearly identical. One should remember, that the AMD processor is a quad core and the Intel i3 is a dual core. The 65-Watt power supply has no problem supplying the laptop even under load. 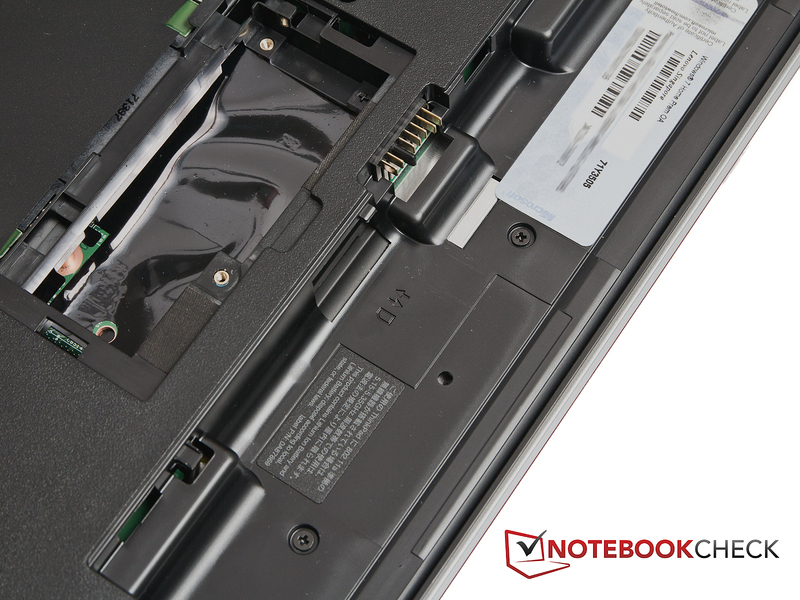 With the built in 6 cell battery, the ThinkPad Edge E525 has a reasonable battery life. It is not exactly as long lasting as cross country skiers, but there are also similar notebooks with significantly less battery power. In our idle tests (Battery Eater Reader's test), the E525 lasts a period of 6 hours and 24 minutes. The result of the test, in which we surfed the net via wireless LAN is more realistic. Here, the E525 ran for a period of 4 hours and 39 minutes. DVDs can be easily finished in one go, even if they have extra length. 3 hours and 24 minutes should be enough to finish almost any movie. Under stress (Battery eater classic test), the duration is reduced to 1 hour und 31 minutes. Someone who wants to have a little more battery life for his laptop, should look for the larger 9 cell battery. The battery is called the ThinkPad Battery 25++ (9 Cells, 51J0500) and is available online for roughly 79 Euros. 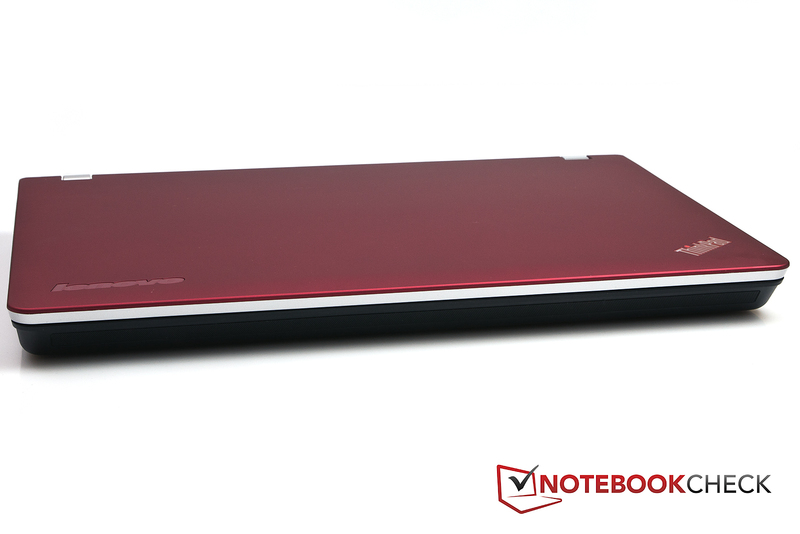 With it, the battery life of the notebook can be increased again. In direct comparison to the ThinkPad Edge E520, when left on idle, there is very little difference in battery life. During internet surfing over WLAN, or during DVD playback, the Edge E520 has the lead however. Under full load, however, the E525 Edge has a slight advantage. 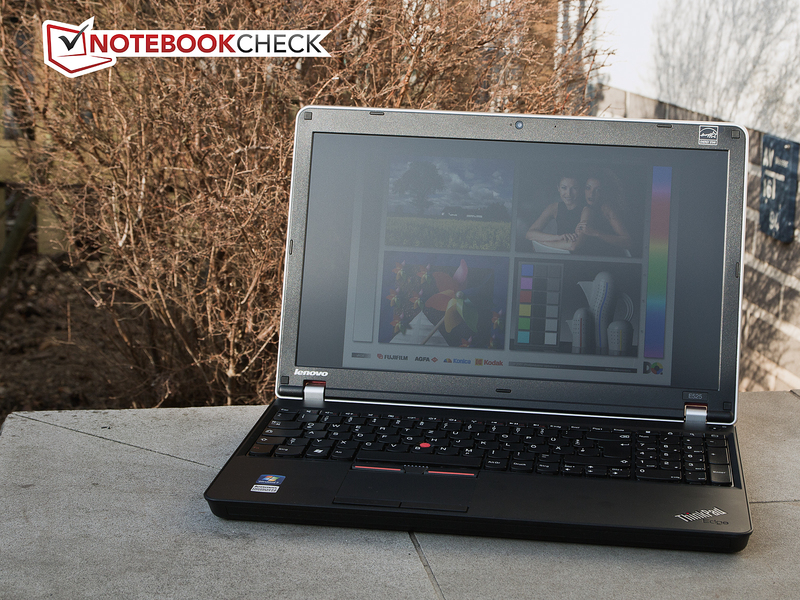 The ThinkPad Edge E525 left us with mixed feelings. First, the laptop makes a good impression in some places, while it does not make a satisfactory cut in others. Thus, the fundamental design impresses, especially as the materials don't seem to be vulnerable to fingerprints and scratching. But, then the mediocre workmanship is atypical of Lenovo. A loose battery should really not be present in a ThinkPad. Keyboard and mouse replacements do not give any complaints. Here you get what you expect from a ThinkPad. The number pad and trackpoint are welcome and especially useful extras. The display given to us for testing has thoroughly failed to convince us. The only advantage that the screen has is the matte surface. There is poor and non uniform illumination around the display. As was expected, the notebook does not have enough power for serious games. The application performance however, is decent. Someone who uses the notebook for business or office use will have no problems with performance. Again, the low temperatures and noise from the notebook were very pleasing. The battery life is sufficient but not outstanding, and if needed, the accessories supply a larger 9 cell battery. All in all, the Lenovo ThinkPad is not easy to assess. Although the non uniform display illumination is disturbing, the matte coating is far more valuable for office use. Here, system noise and heat are more important than gaming performance. 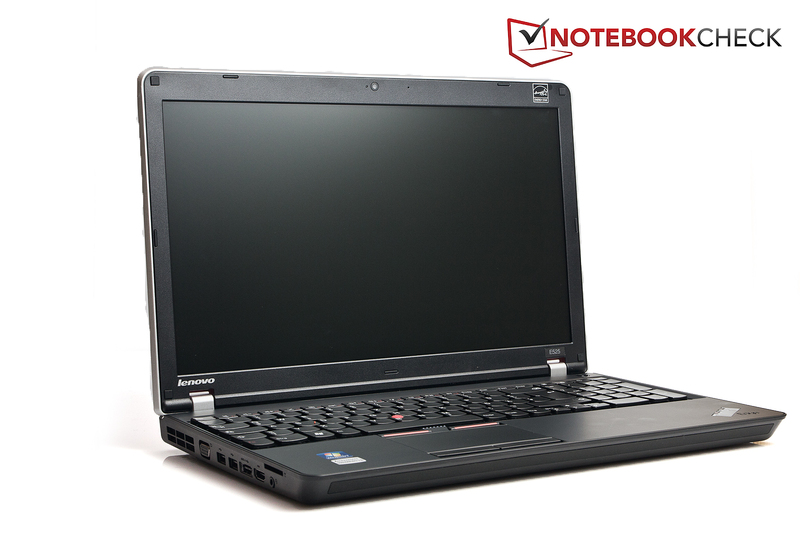 It depends on individual priorities, whether the ThinkPad E525 is attractive or not. The hinges are quite stiff but offer sufficient support for the screen. The ExpressCard-34 slot is a special feature as it is not available in every laptop. The back of the ThinkPad Edge E525, without the docking port. The battery wiggles slightly in its slot. The flaps on the bottom of the laptop can be removed by taking out a few screws. ...and hard disk are easily accessible. A SIM card slot is also on-board. The power adapter (65 W) is small and well-proportioned. A numeric pad is also provided. Every ThinkPad should have one: the red trackpoint. the user can see the matt synthetic material used for the laptop. Outdoors, the notebook has no problems. A webcam is also available. Keyboard and mouse are convincing, its nice to see that Lenovo make cheaper regular notebooks with regular input devices. A better display than the current. We expected much more from the display. A shaky battery and DVD drive should not be present in a ThinkPad. One competitor comes from Lenovo's own ranks, the Lenovo ThinkPad Edge E520 is a stronger rival - more expensive, but with Intel Core processor and slightly better application performance. Corresponding notebooks from other retailers, such as the HP's ProBook 6560b, Samsung's 200B5B, Toshiba's Tecra R850 or Dell's Vostro 3550 notebooks.